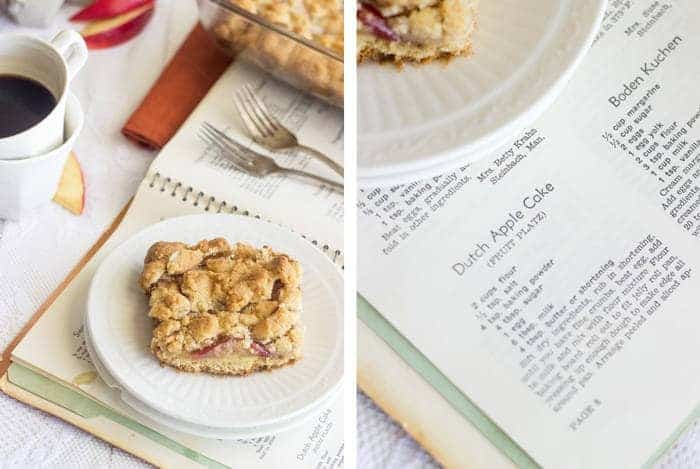 Grandma’s Apple Dessert Recipe, known as Platz, is a super simple and easy German, dessert that is straight from Grandmas Kitchen. It’s sweet, buttery and delicious! You can even change it up to use whatever fruit you have on hand. You want to know what always befuzzles me? Why you Americans call the shoes that you are active in “sneakers”. YOU DON’T SNEAK IN THEM. In Canada, we call them “runners.” You run in them. It makes sense. Sneakers doesn’t. Unless you’re training to be a ninja. Then “sneakers” is acceptable. I actually didn’t even mean to talk about runners and sneakers. It just kind of…happened. Like a lot of things I write about. I was actually going to talk about the befuzzling fact that anything baked by a Grandma is always magically delicious! A Lucky Charms commercial just came on TV…if you didn’t guess. It’s also almost St. Patricks day. So, there’s that. Grandma baking. How do they do it? They make the best healthy ginger snaps, the best gluten free shortbread cookies, the best EVERYTHING. Do you learn the secrets once you reach G-ma hood? Is it something that was only taught back in zee Old Country where they had to walk up hill to school, both ways, WITH NO SHOES? If it’s the former…I am rethinking the whole waiting for little FFF’s…so I can speed up the unlock-age of the baking secrets. If it’s the last? Um. I’m inventing a time machine? Look for the how-to on the blog soon! Except don’t. I can’t even divide numbers anymore. A time machine? Ya. Not happening. Ever. If you remember, a couple weeks back, I made some Chicken Zoodle Soup in honour of my Grandma being here from Canada to visit for a week! She actually brought me this SUPER OLD cookbook filled with all these ah-may-zing German/Mennonite (my background) recipes of all the food that I grew up eating, but didn’t know how to make. You may or may not be seeing these recipes appear in the future. One of the days that my G-ma was here, we had a good ol’ baking day – just like we used to when I was a wee little tyke. It was SO hard to choose which recipe to expose you guys to first because, well, Germans? They make GOOD FOOD. How-ev-er, I decided that I wanted to show you guys the dessert that is at EVERY single family function that I have ever attended in my 23 years of life on this earth; Platz. Quick pronounciation lesson. It’s pl-aww-ts. Like “awww, what what a cute puppy!” Not pl-ahhh-tz like “ahhh, that’s one big dog and it’s going to bite me if I pet it!” Do you feel knowledgeable now? The beauty of this recipe is that it is insanely easy AND customizable. Don’t like apples? Throw in another kind of fruit! 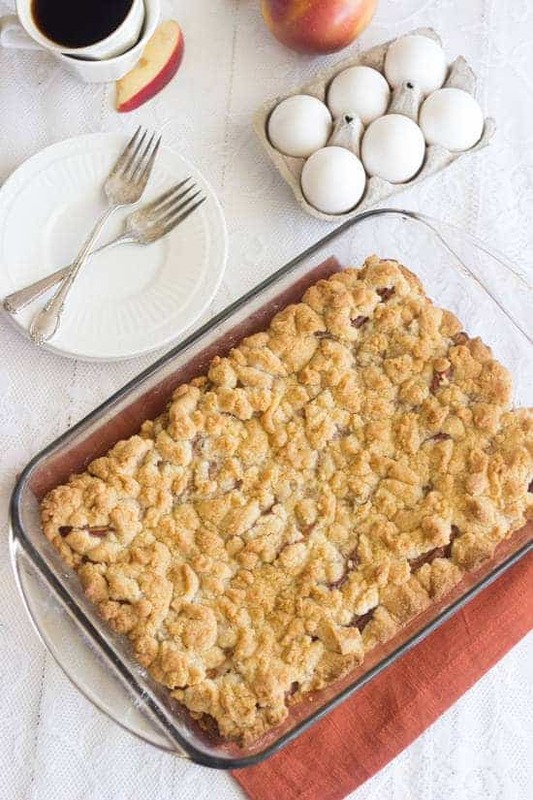 For our family gatherings, Grandma always made half plum platz and half rhubarb. Yumyumyum. You can also use entirely all purpose flour, as that is how grandma always made it…but I had to give it a LITTLE “Taylor-i-fying” and we used half all purpose and half whole wheat pastry flour. It tastes JUST as good half/half as entirely all purpose, in my opinion! It’s still buttery and crunchy and sweet and….my childhood in a 9×13. I bet you even have all the ingredients in your pantry. So why are you still reading? Try something new. Eat platz. Love platz. And then be excited because you’ll be getting alllll of the good, German recipes coming to a blog near you. P.s My Grandma? She’s adorbs. 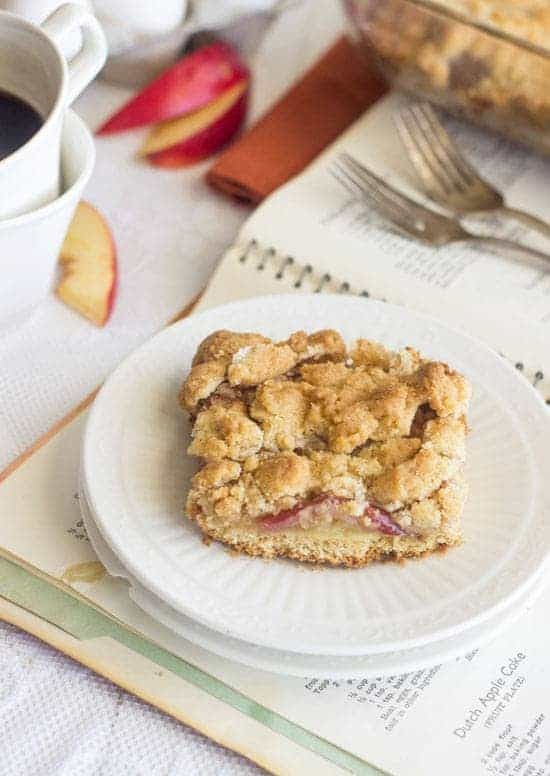 Grandma's Apple Dessert Recipe, known as Platz, is a super simple and easy German, dessert that is straight from Grandmas Kitchen. It's sweet, buttery and delicious! You can even change it up to use whatever fruit you have on hand. Preheat your oven to 375 degrees. Spray a 9x13 inch pan with cooking spray and set aside. Into a large bowl, sift together the dry ingredients. Rub in the butter until you have fine crumbs. In a separate measuring cup, measure the milk and then beat the egg into the milk. Stir the egg/milk mixture into the flour mixture and mix until well combined and a dough forms. 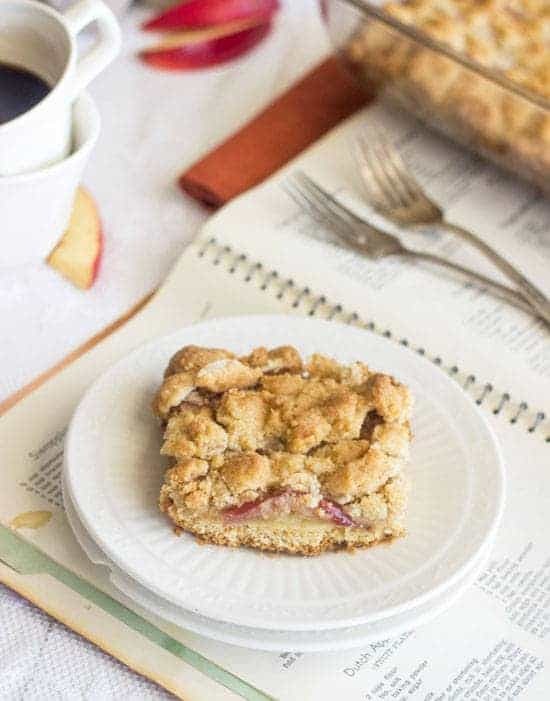 Slice each apple into 16 chunks (quarter it, and slice each quarter into 4) and spread evenly over top of the crust. Set aside. 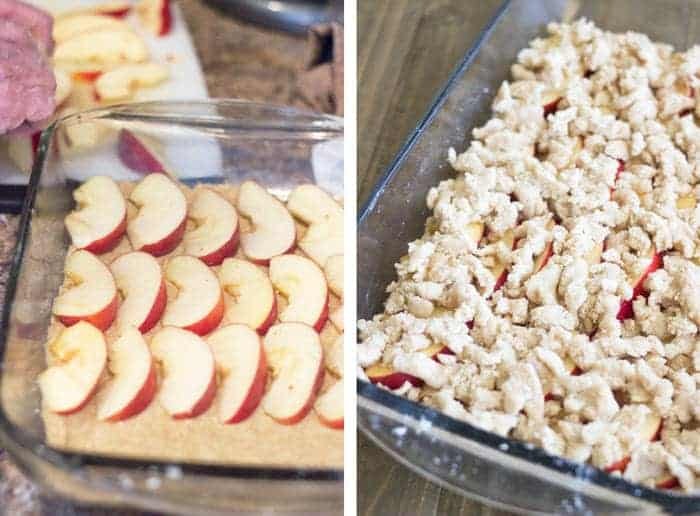 Sprinkle the crumbs evenly over the apples and then bake for 25-30 minutes, or until the top is golden brown and crunchy. ** We used about 1 3/4 cup flour. Start with 1 1/2 and see how your crumbs feel. They should not form one big ball, but should be slightly dry and be easy to crumble. Pre Christmas was my favorite too! All the cookies! Thanks Jess 🙂 Happy weekend girl! Grandmother’s always have the best desserts! It is just a fact of life 🙂 This apple platz sounds amazing! Love that topping. I could down this pretty fast. I know right? I want the secrets! oh…we downed it so fast I don’t even wanna tell you…Thanks Laura! In Sri Lanka, we used to call “runners” aka “sneakers” – tennis shoes! Funny thing was we didn’t play a lot of tennis there – a lot of racquetball and a lot of cricket but not tennis – go figure huh! 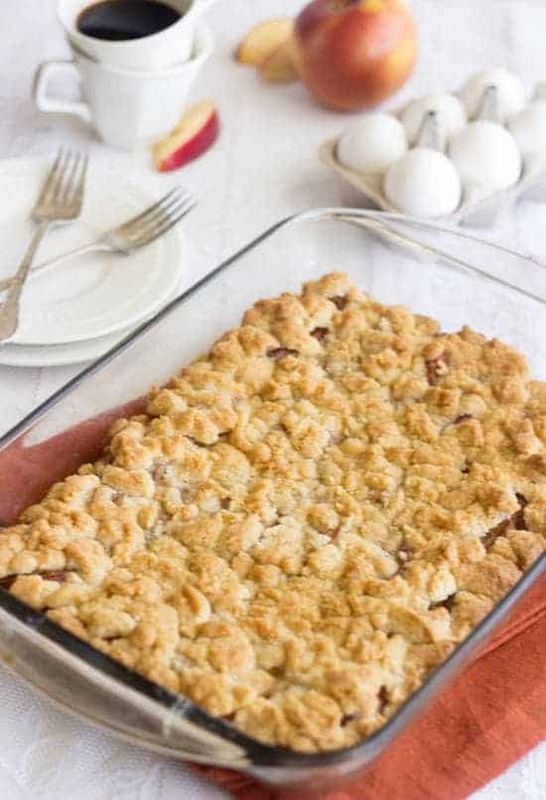 Getting back to your Grandma’s platz, Taylor it sounds wonderful – almost like a apple pie with a streusel-like-ish topping! Yall had this for dessert? Would it be crazy to have this for breakfast? Haha that is so bizarre! Shoe names are the weirdest! Exactly like that! We had this for dessert always…..BUT I am LOVING your breakfast idea! Yes you do! It’s nice to change ‘er up every so often! Oh my goodness, this is so lovely!! I love Grandma recipes like this – so yummy! They do make the best food! Thanks Katrina! This looks so great; seems super easy to sub in seasonal fruits too. The grocery store apples aren’t great this time of year. It is definitely super versatile! Gym shoes makes WAY more sense! Love treasured recipes like this one and how you made it healthier! Your grandma is tots adorbs. Don’t you just love all grandma recipes?! I wish I could bake like both of my grandma’s…I didn’t get that gene. Total bummer. This reminds me of every holiday time, I watch my Mom make Povitica…Croatian Nut Bread. Ugh so good and so not good for you waist. But when it’s made you just gorge yourself with it! I have no idea what that is, but it should stay that way if I wanna fit into my skinnies! Sometimes you just gotta though! Love your post about Runners and Sneakers .. I know what you mean, I used to live in USA, now I am in Canada. I also remember this apple platz from Europe:) I was born and raised there.. so similar cakes we made:) Delicious! Oh Canada…how I miss it! I am super excited that you know what it is!!!! 🙂 Thanks Ilona! Right?! They are always the best! HAHA…I don’t run either. ever. Let’s call them weight shoes. Just ask me how much I’d love to have this for breakfast right now! YES please! Looks delish! Can you go wrong with a recipe from a grandma? I don’t think so! This looks incredible . You really can’t…love in every bite! Thanks Maryea! Awww I’ve been waiting and waiting and waiting some more (rather impatiently, I might add) for a story about your grandma’s visit to show up on your blog!! Especially after that adorable Instagram picture from picking her up from the airport. How could I NOT love both of you?? 🙂 So I have never heard of Platz before, probably because all of my grandparents grew up on farms in the midwest, but I’ve been practicing saying it the entire time while reading your post so I can pronounce it correctly when I see you in 2 months. Literally 2 months!!! WHEEE!!! (Sorry, slight tangent. But I’m excited.) It looks fabulous!! P.S. Are you really 23?? Haha I held out JUST FOR YOU. Cause I’m a mean person like that. Ohmygosh you are hilarious..that better be the first thing you say to me girl! I just practiced. Again. Because I want to make the best first impression I can. I want you to like me! 🙂 Ohmygoodness. This twins-separated-at-birth theory just keeps getting better and better… I’m the same age! haha giiirrrrll, I already love you! And your awesome banana trip! SERIOUSLY?! ok..yep…we’re twins. That’s final! Aww, your gma is so adorbs! And so great that you are sharing her recipes on the blog! This looks amazing!! 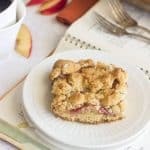 All that crumb topping – yum!! I have never heard the word Platz before, so thanks for the pronunciation education! Definitely adding that one to my vocabulary and my “to make” list! This looks really tasty! 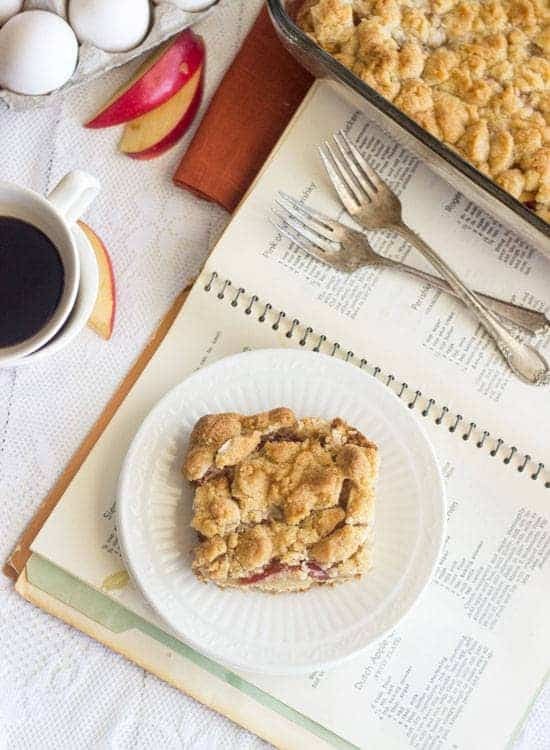 That’s so cool that you have recipes passed down to you from your grandma. One of my grandmas is German as well, but she never really enjoyed cooking or baking, and so unfortunately I don’t think there are any recipes to be handed down from that side of the family. Also, I had never thought about how weird it was that we call them “sneakers”! To be fair, I usually just call mine “running shoes,” but I did grow up calling them “sneakers.” How odd! 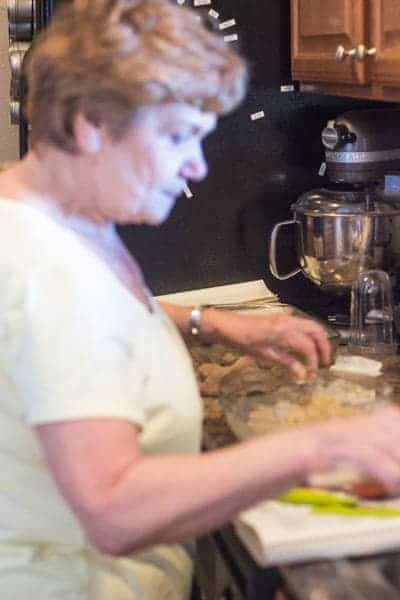 A grama that didn’t enjoy cooking or baking? That is tragic! Well I hope you can get some grama love through this CakePants! Isn’t it weird when you think about it?! Makes no sense! I love everything about this post – you actually made me laugh out loud! I can’t wait to make this (looks amazzingg) and how did I not know you were a fellow Canadian? 😀 Haha, in Toronto, where I grew up, we call runners “kicks’ haha! And your grandma is adorable!! Your grandma is so cute!! I love that you had a baking day! That is so much fun – and so special!! Oh – and it’s totally magic. My grandma is the exact same way. She’s 86 years old (and the cutest little thing you ever did see!) and anything she bakes is magically wonderful. Her food just tastes better. How about that kuchen recipe also on that page?? Gonna share that one, too??? 86 eh? Wow! It’s totally crazy, I don’t know how they do it! I hope one day I have that gift! Oh man…berry or peach platz would be divine!! I am from USA too and i have heard them called sneakers and gym shoes but we always called them tennis shoes too. So many names for one thing! I made this with fresh plums my German friends loved it reminded us of Germany I will make it again this weekend . The word “sneaker” is often attributed to Henry Nelson McKinney, an advertising agent for N. W. Ayer & Son, who, in 1917, coined the term because the rubber sole made the shoe stealthy. The word was already in use at least as early as 1887, as the Boston Journal made reference to “sneakers” as “the name boys give to tennis shoes.” The name “sneakers” originally referred to how quiet the rubber soles were on the ground, in contrast to noisy standard hard leather soled dress shoes. Someone wearing sneakers could “sneak up” on you while someone wearing standards could not. Wished that you published the nutritional information for your recipes. Is that possible? Maybe I missed it. Hi Eileen. I actually have been doing so on all recipes for the past 6 months or so, but unfortunately this is a very old recipe and I don’t have it. Feel free to pop it into something like myfitnesspal.com. Hope that helps!